Wow! The last week has been a whirlwind, truly. Blue Notes was free on Amazon for 5 days, during which time it sat at #1 on the gay literature free books list. That totally blew me away. Then Dissonance was released to amazing reviews from Scattered Thoughts and Rogue Words (Melanie named it one of her “Best of 2014”! ), Rainbow Book Reviews, Smoocher’s Voice, and Love Bytes. But there was something even better than all that. Something that made me just want to sing! You. You the readers contacted me. I have never had so many personal messages, emails, and posts about my books before. I heard from long-time readers and brand new readers about how they–you–loved my books and my characters. Particularly moving for me were the comments from survivors of child abuse who, like me, saw a lot of themselves in the character of Cam in Dissonance (who is based on a compilation of true stories). Those messages of love and support mean the world to me. More than you know! I would never share a personal email or message without permission, of course. But those messages reminded me that readers can do a great deal to support their favorite authors. So I’m writing this post not just for myself, but for all of the authors you enjoy. I’m writing to ask that if you feel inclined to do so, please share that love with the world! 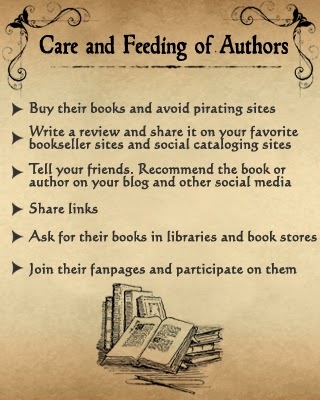 The meme says it all: the care and feeding of authors depends on readers. Please considering reviewing on Amazon, Goodreads, AllRomanceEbooks, Barnes & Noble, and anywhere else you buy and discuss books. Reviews don’t need to be long, they just need to be honest and hearfelt. A few sentences about what a book made you feel may be the inspiration for another reader to read a book you loved. Word of mouth makes all the difference to authors. It helps sell books, and more books sold means more books written. A win-win. Nice post, Shira. I’ve been looking forward to Cam’s story for quite a while!